Owner will look at financing with one third down. Owner is retiring, will entertain any reasonable offer. Conveniently located 3½ miles from the City of Prince Albert, this dwelling enjoys all of the beauty of the country and yet is close enough to the city to enjoy all of the amenities. Numerous golf courses and lakes are very close and the Highway #11 heading north-south is just 200 yards away. 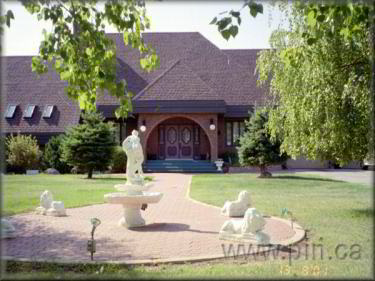 There are numerous extra features that make this home unique in the entire Province. Three beautiful and functional natural wood burning fireplaces; one on each level. A very large whirl pool, a very large sauna room, plus a double wide hot tub in the master bedroom. Cathedral ceilings with oak trim in the living room, the dining room, etc.. Cast iron lamp post, light fixtures, statues and benches. The yard is very very well kept. The lawns are cut, the hedges and trees are trimmed. Close to the house in an additional 6-car garage to store the owner toys. There is a green house, another 2 car garage and another 6 car shed at the far east end of the property. There are also 2 ponds on the property. One is used for irrigation of the lawns, the other as a fish pond.